I am now back from Khon Kaen, Thailand. Recall that the college has had a formal partnership with the Faculty of Education at Khon Kaen University (KKU) for 15 years. I usually like to communicate about college international trips while I am there. In this case, I simply had no time. As part of this trip, Paula Groves Price and I provided keynote addresses to an international curriculum conference being held in Khon Kaen. As part of the meeting, we also listened to graduate student presentations and provided formal feedback for master and doctoral students. In addition, we provided workshops for graduate students that lasted the better part of two days. Getting to Khon Kaen is no simple task. Flights from Spokane to Seattle, Seattle to Tokyo, Tokyo to Bangkok, and Bangkok to Khon Kaen are required. Those that do the trip know just how demanding the travel is and it is a bit of a bond we share with our Khon Kaen colleagues who travel to WSU. The only way these relationships survive is if individuals from both places are willing to do this travel. We met with Khon Kaen University’s vice president of international affairs, as well as its president. Many university partnerships exist in name only, and little is actually done. Both these Khon Kaen administrators expressed gratitude for this international partnership actually being one of action. When KKU faculty and students visited WSU last April, we signed another five-year Memorandum of Understanding (MOU), which governs the relationship. The visit by Paula and me marked the first set of activities under the new and expanded MOU with KKU. In the past, educational administration was the focus for KKU and WSU. For this trip, educational administration, as well as curriculum and instruction, were the foci for this trip. We toured their Autism Research Center and Demonstration School on campus and discussed yet other possibilities for the future. Thailand is a developing country and one of contrasts. This is no more apparent than in Khon Kaen, the seat of commerce and government for the northeast region of Thailand. When I visited there in 2001, I saw a Mercedes Benz, a couple of elephants, and a family of four riding on a Honda 90, with none of the riders wearing a helmet. Last year, and in this visit, I saw a good deal of development, with new housing units along a lake in the downtown, and many new buildings. No elephants were seen this time, nor a Mercedes Benz. I did see several big, new SUVs (further signs of overall development) and more people wearing helmets, which is now the law. Still, there were plenty of families traveling in Khon Kaen on one small motorcycle without any protective gear. The hotel we stay at is very nice. A short walk down a street with several bars and restaurants and you’ll see a Starbucks. Visible from our 11th floor room are dwellings with people living in abject poverty. Whatever we do as a college for KKU is warmly embraced and lauded by faculty and administrators. We really feel appreciated for the work we do and, in some small way, feel like we are making the world a better place, though I want to be careful not to overstate what we offer. In short, this is simply land-grant university work. I hope that the college will continue this partnership for years to come. Given the relationship and the accomplishments thus far, I think this partnership can be a signature international collaboration for the college. On our trans-pacific flight there, we flew into the jet stream. I like reading the flight data that is provided for each passenger. On this flight, the head wind in mph was given, along with the ground speed and air speed. This reminded me of my high school teaching days. Many of you know that I use to be a high school mathematics teacher. When I taught algebra, I used to develop algebra problems like: “You are traveling in an airplane at X mph and facing a head wind of Y mph. You need to travel Z miles. How long will it take you to get there?” I suspect many of you might remember knocking your brains out trying to solve these problems! J Anyway, on the way back, we traveled with the jet stream at about 800 mph and at about 40,000 feet. Incredible. KKU faculty and students will be in Pullman in April. I hope each one of you takes the opportunity to introduce yourself and visit with them. Please help make them feel welcome. Paula has a variety of activities planned so there are times to jump in and meet people. As this partnership continues to expand, Paula will be reaching out to faculty to work with KKU. Perhaps a trip to Khon Kaen will be required. Strongly consider this opportunity. While the work can be challenging and the hours long, you will not regret your involvement. I predict you will be changed by the experience. Greetings from Khon Kaen, Thailand! OK, so I travel just a tad. And while I usually try to blog on many of these trips, I was so busy this time around that I wasn’t able to do it until heading back to Pullman. 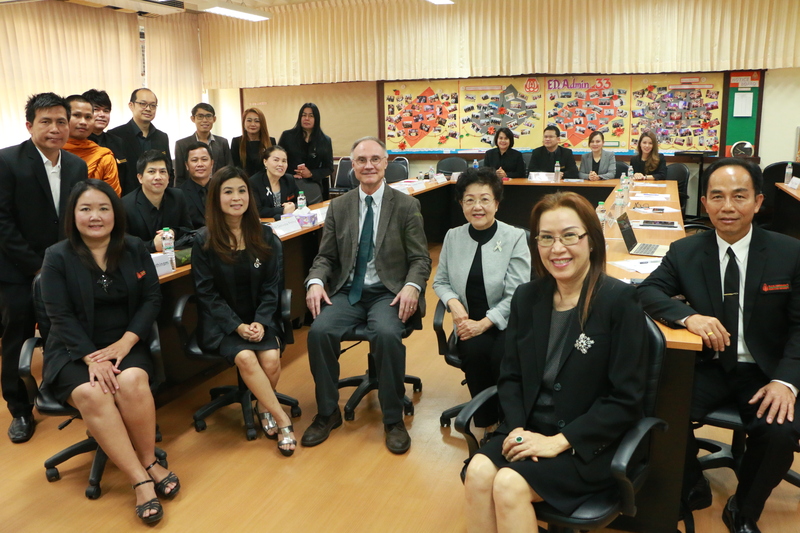 The College of Education has had a partnership with the Faculty of Education at Khon Kaen University (KKU), which is in Khon Kaen, Thailand. This partnership is bound by a Memorandum of Agreement (MOA) between the two universities, signed by President Floyd in 2012. The now-retired Dr. Forrest Parkay was the faculty member – and main driver – responsible for the partnership. Forrest started this work as a Fulbright Scholar in Khon Kaen several years ago and the partnership has existed to this day. Most of the work involves providing pedagogical support to KKU’s Ph.D. program in Educational Administration. We’re in the latter half of the current five-year agreement, and now that Forrest has retired and key administrators at KKU are soon to retire, they’re interested in firming up the next arrangement. This trip was to discuss the MOA renewal. When KKU requested renewal, I met with Dr. Paula Groves-Price, Associate Dean for Diversity and International Programs, to discuss whether the college should continue the partnership. She and I quickly agreed that continuing this would be in the best interest of the college. Thailand is a developing country. Khon Kaen, as the seat of commerce and government in the northeast part of the country, is a city on the move. While we have much to offer KKU, they have much to offer in return. Any faculty member who travels to KKU for work will not return quite the same. The experience will generate new possibilities. I find that some of the most rewarding and fulfilling aspects of international work include a new perspective and fresh set of ideas. While at KKU, administrators asked me to provide a two-day workshop to their Ph.D. students on the topic of research and evaluation. I found students to be eager, if not hungry, for new knowledge and skills that could enhance their professional practice. Most of these students are already school principals. Thailand is in the midst of an education reform, putting school principals in an important role as instructional leaders; a role they have historically not been expected to fulfill. The workshop was geared to developing school principal capacity as instructional leaders. Students are also learning English. There were 20 students in the workshop, all with varying degrees of English skill in writing, listening, and speaking. I provided content, and set up group activities to apply the concepts. Once in groups, a student with a good command of English would lead the discussion and work, and do this in the Thai language. This lead individual would work to ensure that all group members understood the background material and task. The class presentations and products were done in English. I have always found teaching to be, in part, an intellectual activity. I was not well prepared for the language differences I experienced in the workshop. However, I found this aspect very interesting and students made it easy for me. It was a pleasure working with them. This is not my first trip to Khon Kaen, or KKU. I visited in November 2001 to conduct a two-week intensive workshop on developing dissertations. I teamed up with Forrest for that work, which was done before a formal arrangement was established between the two universities. On that trip, I took my family with me. My wife accompanied me on the current trip. We were able to spend time eating with people we got to know back in 2001. This was good fun and a highlight of the trip for us. Our college worked with Dr. Asif Chaundry, Vice President for International Programs at WSU, to begin thinking about a renewed partnership. Paula and I also came to the conclusion that there is a good deal more the College of Education could offer to the partnership, and that the college would be better served if the partnership was managed in a similar way as is done with the Nishinomiya, Japan partnership. A key feature would be an open, transparent process for who would work with KKU at any given point of time. In addition to supporting their Educational Administration doctoral program, other key areas in which we could collaborate, and be well received by KKU faculty, would be: STEM education, diversity, curriculum and instruction, and special education. Faculty and student exchanges could also be options. I spoke with KKU officials about these ideas and they conveyed strong interest in an arrangement like this. In the next few days I will work with Paula to further develop the MOA document, building on Forrest’s good work, with an eye toward a new arrangement that both KKU and WSU will find beneficial. I am pleased with the college’s portfolio of international work. A new MOA with KKU will be a wonderful component to this work. Annyong haseyo from Seoul Korea!